A new, small-budget game tells surprisingly moving story about coming of age, sexuality, and the '90s. Common gamer wisdom says that in order to achieve maturity, realism, and thematic complexity in video games, developers have to add cutting-edge technology: vivid graphics, plausibly animated characters, advanced systems of artificial intelligence. So the notion that a sophisticated story experience is best attained not by marching forward technologically but through restraint and good design is somewhat radical. Yet that’s exactly what the four-person Fullbright Company set out to prove with Gone Home, a new PC release that’s being widely lauded as one of the best storytelling games in some time. It does a few remarkable, even brave things, thematically—like exploring the relationship of two teenage girls in love, and focusing only on a troubled family. But what makes Gone Home a special achievement among games, though, is all the things it doesn’t do. Many developers have longed to incorporate literary storytelling elements into video games for a while now—but they often stick to the formulas of commercial action thrillers anyway. Gone Home represents a necessary shift in focus, and it does so in a no-frills way that other video-game developers would be wise to take note of. Gone Home takes place in an empty house in the Pacific Northwest, dauntingly large and littered with fresh artifacts of its inhabitants’ lives. The main character is Katie Greenbriar, who’s recently returned from a year abroad and has just arrived at the sprawling old inherited home where her family’s been moving in. But there, she discovers that everyone is missing—and an ominous note on the front door from her teenage sister, Samantha, warns her not to go searching. The delicate little story that emerges as Katie explores the house, reading notes and examining objects left behind, is much like the design itself in that it relies on conventions only to subvert them. It’s so delicate, in fact, that to say too much about it spoils the game. But what can be said is this: It’s about a troubled middle-class family; their nonconformist and witty teenage daughter (Katie’s sister Sam); and Sam's first love, a girl from her school named Lonnie. Their story unfolds through letters, photographs, Super Nintendo cartridges, and music tapes, peppered with the Riot Grrrl spirit of the early 1990s (the music of Bratmobile, Heavens to Betsy, and The Youngins has been licensed for the soundtrack, alongside Chris Remo’s original score). The '90s are the perfect time frame tonally, but there’s a functional purpose for setting the story there, too. Without all the implements of the modern digital age, there's more for the player to look at and do; today, one could probably find out all Sam's secrets just by getting hold of her phone. The game’s reception from the traditional gamer community has been fascinating—and revealing. To many of these players, a game whose only action consists of examination and exploration is no game at all. “I went from start to end in one minute, 10 seconds, and 40 milliseconds,” one forum commenter on a Steam community page complained to fellow gamers. “This is not a game.” Much of the criticism is so fervent you’d think the army of 18- to 24-year-old males who make up the bulk of gaming’s old-guard audience were deeply afraid the nature and purpose of playing digital games might change. 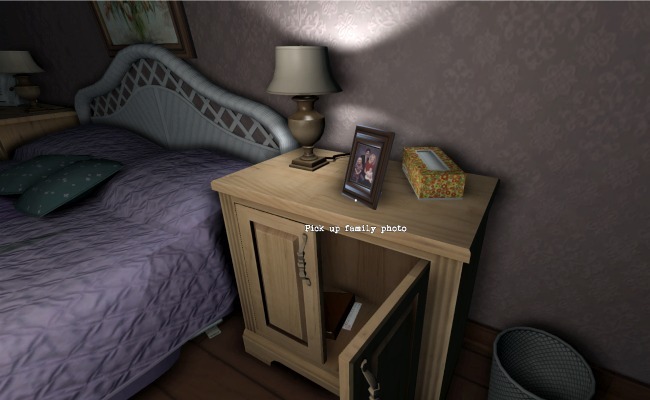 Gone Home also feels a bit like an experiment. It's a new, effective attack on the convention that in order to be plausible and poignant, game stories necessarily need more complicated systems, higher-resolution graphics, the participation of real-world actors, and heaps of choices and rewards. The game runs counter to the philosophy governing, say, the E3 Electronic Entertainment Expo, a lavish annual showcase of the commercial gaming industry’s freshest offerings tells fans, the press, and retailers alike what they ought to want to buy, alongside throbbing speakers and bright lights. At this summer’s event, French studio Quantic Dream tried to dazzle audiences with a fully-rendered digital human head so lifelike that its eyes seemed to penetrate onlookers, and some Next Great Military Game—one of the many—pointed to the forearm hair detail of its virtual soldiers as evidence that the future is here. Steve Gaynor, founder of Gone Home developer The Fullbright Company, got his start in this world of big budgets and blistering combat. He and his colleagues did several years of work on 2K Games’ key BioShock franchise, which aims to combine first-person combat with politically charged locales. Gaynor earned acclaim from the gaming press in 2010 when he led design on Minerva’s Den, a self-contained downloadable adjunct to the BioShock 2 universe. Guiding a player through a meaningful narrative experience in a combat-focused game is more difficult than it might sound. How do you make sure the player follows the intended route, discovers the necessary information, and still keeps his or her crucial sense of agency over the experience? But Minerva’s Den was uncommonly deft, and in the wake of its positive reception, Gaynor wondered what it would be like to make a game about discovering a story within a world. What would it be like to make a game only about that discovery, without the combat, weapons, lore, or dialogue? Hoping to find out, Gaynor left 2K with two colleagues, co-founders Johnnemann Nordhagen and Karla Zimonja, and the trio packed up for Gaynor’s old hometown of Portland to try something new. Small games have small budgets, so Gone Home’s story had to be confined to a single location: a house. (Its creative team found itself in a similar situation, as Gaynor, his wife, and his colleagues moved into a large shared home and worked full-time on developing the game.) Gone Home couldn’t have realistically animated, vividly forearm-haired characters, so the house had to be empty. Making it dark outside simplified the graphical obligations (the windows, for instance, became less complicated once they weren’t looking out over a daytime scene). In a way, the simplification of the setting actually enhances the effectiveness of the game overall; the lack of flashy environmental “realism” minimizes distraction, allowing the player to focus fully on its affecting story. For video-game designers, though, erring on the side of gentleness is probably wise, for now. Gone Home’s lesbian love story is treated with dignity and restraint, admirably avoiding the clichés most media stumble into when trying to tell stories about gay people: The characters are not made tragic poster children, nor objects of pathos for straight guilt. In a perfect rejection of both traditional video games and gay-tragedy-tropes alike, the stark, bright red stains the player comes up upon in a dimly-lit bathroom turn out to be hair dye. Fans have long dreamed that someday, video games would be viewed as a sophisticated medium of immersive storytelling, garnering the same kind of cultural legitimacy as cinema or other art forms. Largely, though, the games that have mainstreamed gaming (Nintendo’s Wii software, Candy Crush Saga, Rock Band) have little interest in immersive storytelling or some quintessence of the human experience. Though passionate fans of gaming may long for it to play the role of high art, the most avid game consumers—those who reliably move truckloads of Call of Duty and Grand Theft Auto from store shelves—often resemble a certain breed of sports fan, hungry for the simple rush of moment-to-moment action. The games that sustain the commercial industry by their sales tend to be sequels to those that have done so before. Though unusual in its willingness to be simple, small, and human, Gone Home probably isn't going to be the game that singlehandedly revolutionizes how broader audiences think about video games. Its keyboard and mouse controls are still traditional PC gaming language, and it was released on Steam, a popular digital storefront among fans. But the combination of these familiar elements with a fresh, surprising approach to storytelling could, in fact, be a boon: More players and developers will be exposed to Gone Home’s important message that games can, in fact, gain meaning, and they can do it by doing more with less. Leigh Alexander writes about video games, interactive entertainment, and contemporary culture. Her work has appeared at Gamasutra, Edge, Boing Boing, Nylon, Slate, Wired, and Paste.